As early as 1941, the success of the German StuGs alongside the Panzergrenadiers on the Russian front, led the Soviet head of staff to think of massively building a similar vehicle, preferably on an existing chassis. However, this was not the first attempt to produce such a vehicle. 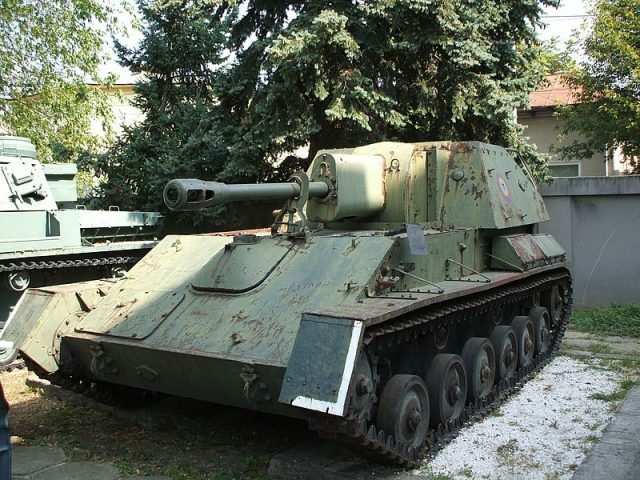 As early as 1936-37, a limited series of SU-5 self-propelled guns were derived from the T-26 and used in the occupation of Poland in September 1939. By the summer of 1941, an expedient was chosen, with a ZIS-30 AT gun placed on a Komsomolets tractor. Although accumulating problems, it could be cheaply produced and was, for a time, able to defeat most German armor on the field. Later on, during the siege of Leningrad, a limited number of SU-76P (for “polkovaya” -regimental) were made, an expedient marrying a turretless T-26 with a platform on which a 76 mm (3 in) regimental field gun was mounted. Although the crew was completely unprotected, the gun could traverse 360° and therefore did not require to turn the chassis in order to aim, contrary to most SPGs. This vehicle was intended to deal with “soft” targets (infantry), which the regular 45 mm (1.77 in) could not due to the lack of adequate ammunition. 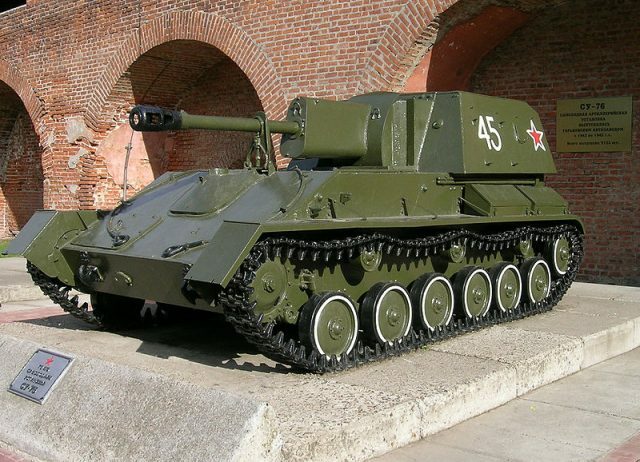 The Red Army needed a better protected SPG and, as so many T-26s had been destroyed so far and the type was no longer in production either, the T-60 chassis was chosen. After the fall of 1941, this model was mass-produced by the newly raised “Tankograd” complex in the Ural. It was sturdy and well capable of supporting the weight of a 76 mm (3 in) regimental KT gun. Already, by the autumn of 1941, the GAZ Factory began, on its own initiative, to create the SU-71. Later, in July 1942, the GAU produced another prototype, the OSA-76 (For “Obshevoiskovaya Samokhodhaya Artilleriya”, all-purpose SPG). This vehicle was armed with the latest ZIS-3Sh divisional field gun and propelled by a GAZ-MM engine. However, production did not followed. Factory No.37 also devised a similar prototype, which failed to pass the tests. 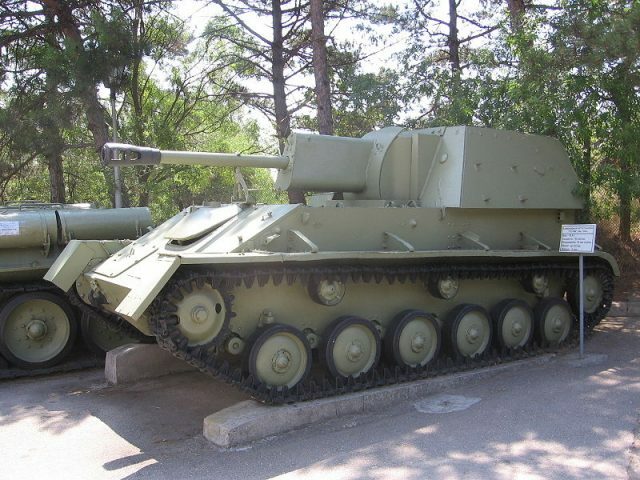 All these initiatives were eventually sanctioned by the October 19, 1942 directive from the GKO to GAZ and Zavod n°38 plants to prepare mass-production of a modified T-70 chassis SPG named the SU-12, mounting the 76.2 mm (3 in) ZIS-3. In November 1942, both prototypes were tested. The GAZ prototype was rejected, while Factory #38 model passed the tests and formed the basis for the mass-production of the SU-76. The latter was made of a lengthened T-70 chassis (with an extra roadwheel pair). A ZiS-3sh was placed at the rear, protected by an enclosed 10-35 mm (0.39-1.38 in) thick sloped armored casemate. Power was provided by two GAZ-202 engines parallel to one another, each engine driving one track. The driver was placed between them, to the front, but had trouble operating them without good training. The gun had a coaxial DT machine-gun and the crew of three also carried personal firearms. 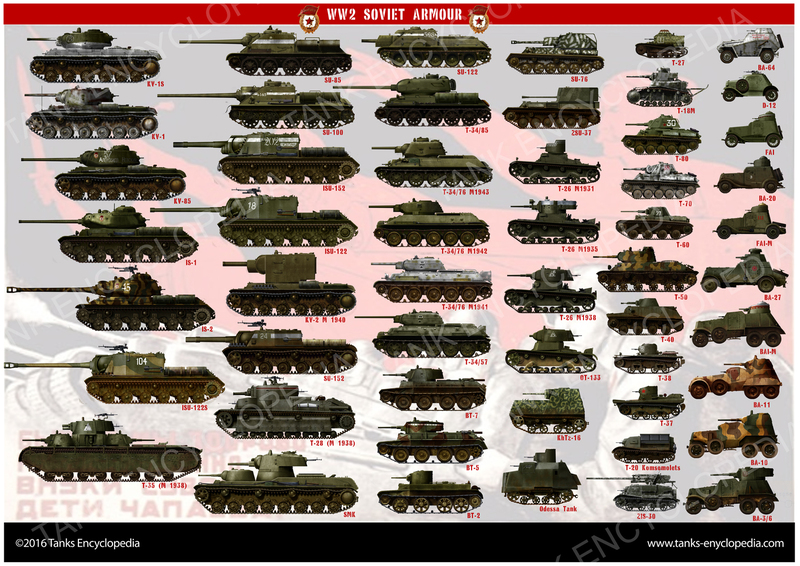 Production started in December and, by January 1943, the first two regiments were sent on the Volkhov front. Operations in the field quickly showed that this engine arrangement caused strong vibrations, which led to early failures of engines and transmission units, often because of inexperienced drivers. This was reported to the GAZ and #38 factories, and production was halted after the 360th vehicle. A pause was needed to contemplate a replacement, and another expedient saw the massive use of captured Panzer IIIs & StuG IIIs, converted with a Russian ZiS-5 76.2 mm (3 in) gun protected by an enclosed armored superstructure. Around 1200 of these SU-76i were fielded before the new SU-76M was ready to enter production. N. A. Astrov and A. A. Lipgart, GAZ plant chief engineers, chose to place the two engines in tandem on the right hand side, so to mate them more easily on a common transmission. The initial casemate roof was eliminated, replaced by a simple canvas. Mass-production of the SU-76M started as soon as February-March 1943. Until 1945, both factories would deliver no less than 13,932 vehicle, of which around 9000 came from GAZ. There was virtually no difference between the vehicles from the two factories. By the second half of 1945, production was halted, since the need for such a vehicle had faded. However, in the meantime, numerous prototypes were tested, like the GAZ-74A, using the ZIS-16F or ZIS-80 diesel engines, or the American Guiberson diesel. The SU-12, SU-16 and SU-38 were all propelled by the same T-70 engine GAZ-203 and armed with the same 76.2 mm (3 in) gun S-15. None were pushed to production. This was a late WW2 Soviet SPAAG (“Zenitnaya Samokhodnaya Ustanovka”), equipped with one 37 mm (1.46 in) automatic air defense gun M1939 (61-K) fitted on a traversing open-top platform, protected by large armored panels, 6 mm (0.24 in) thick. It was produced only from March 1945 to 1948 in 75 units, used in the summer 1945 offensive in Manchuria. 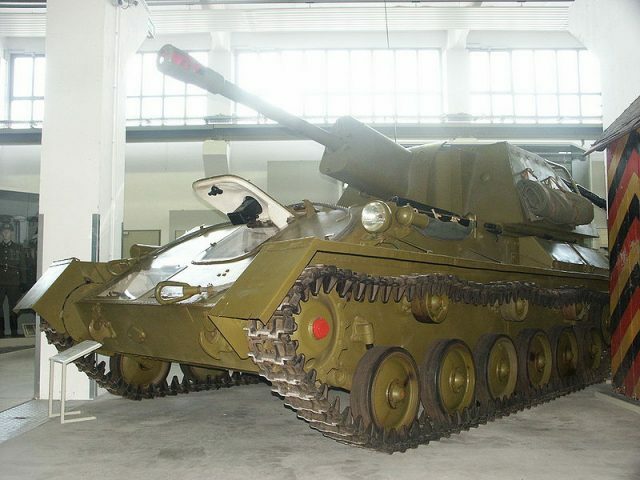 It inspired postwar SPAAGs like the T-54 based ZSU-37-2, ZSU-57-2, later replaced by the ZSU-23-4 Shilka. 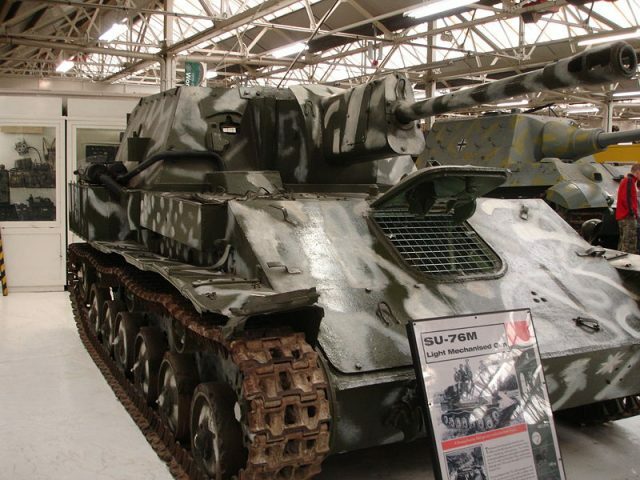 As the first Soviet SPG, the SU-76 filled three roles in the Red Army: light assault gun, mobile anti-tank weapon and mobile gun for indirect fire. In the first case the open compartment eased communications between ground troops and battlefield awareness. It had greater firepower compared to previous infantry tanks, and was hugely popular in its close support role. However, it needed to be well defended by infantry in an urban theater, since its open compartment made it highly vulnerable to grenades and improvises explosives like Molotov cocktails, not to mention the Panzerfaust. In indirect fire, the ZiS-3 had the best maximum elevation angle of any other comparable SPGs and could operate to a 17 km (10.5 mi) range. However, the 76.2 mm (3 in) rounds lacked explosive power compared to 152 mm (5.98 in) howitzers. It was well served by its speed and low ground pressure, despite its vulnerability. It could fire a large variety of ammo, ranging from the usual armor-piercing rounds, hollow charge, high explosive, fragmentation, shrapnel and incendiary rounds. As a tank-hunter, the high velocity of the gun, reinforced by APCR ammunition, could easily destroy any German tank up to the Panther (shot in the flank of rear), but instructions were given to aim at the Tiger’s tracks or gun barrel. It was also well suited for ambushes, having a low profile easy to camouflage and low noise level. It was also fast in reverse if needed. Another advantage procured by the large tracks and low ground pressure was its ability to sneak out through swamps, as it showed during the Belarus liberation campaign in 1944. The SU-76M had a long career during and after the war. Outside the USSR, some were captured by the Axis. German forces making some limited use of these tanks, well-served by their large supply of ammunition for this kind of widespread gun. Allied countries received large supplies of this tank during the Cold War, like Cuba in the early 1960’s, alongside Albania, Romania and Poland. 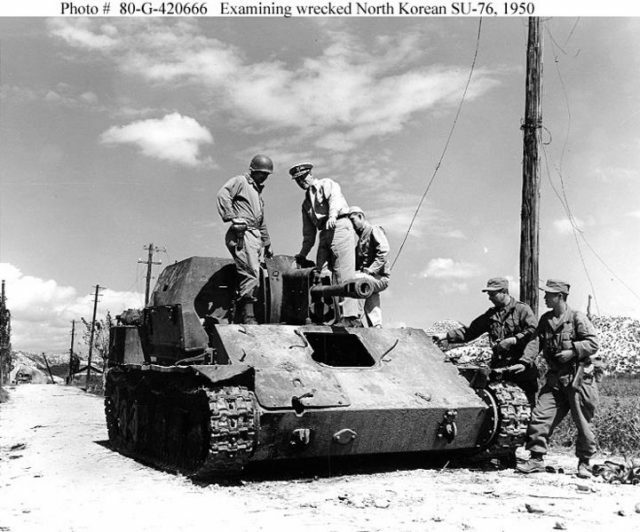 The Chinese and North Koreans also received many, which soldiered during the Korean war, and the North Vietnamese were given some during the early stage of the Vietnam war. Many survived the war. At least seven are in good condition on display in several museums. SU-76, winter 1942. Only 360 were delivered. SU-76M, early production, February 1943. SU-76M, unknown unit, summer 1943. SU-76M, 8th SPG Military Brigade, Belarus front, February 1944. SU-76M “Courageous” from the Transbaikal Front, August 1945. SU-76M with a spotted winter camouflage made with a brush, Belorussian front, winter 1944. SU-76M, unknown unit, Eastern Prussia, April 1945. German SU-76M, 5th SS Panzerdivision “Wiking”, Poland, summer 1944. Hi guys! I don’t suppose you could add one of your excellent profile illustrations of a North Korean one from the Korean War could you??? This would represent its post war use. I thought the Su-76 was based on the T-70 hull? This states that 1200 SU-76i were fielded. I believe that should be 200 instead of 1200. Do take note that the SU-85B in WoT is a fake tank. The designation isnt something i know of, but the tank used is a modified SU-76, not the SU-85. also fake tank pages for both SU-85B and SU-85i pages would be nice. If you’re getting to a point of doing them.